Judging from the output of the loss-making Guardian over the least few days, an EU referendum is a thing to be dreaded – purely on the basis that we are going to have to suffer the tedium of europhiles offering the same stale, tired arguments for EU membership that we have heard so many times before. So far, we have a fairly good handle on their tactics, and they are all so predictable that one is tempted to go to sleep and wake up nearer the time, when the fight has picked up a bit of pace. However, there is one new tactic we need to watch, and that is the recruitment of Open Europe as a "false flag" operation, offering a europhile pitch in the guise of a "moderate" eurosceptic operation. 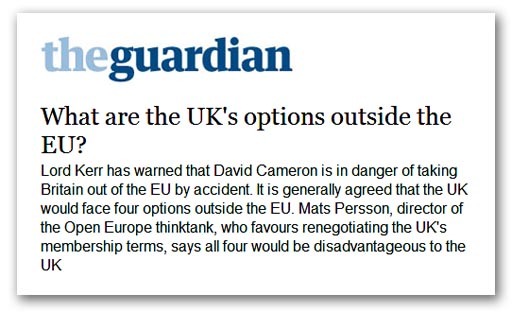 It should come as no surprise, therefore, to see the EU-loving Guardian giving space to Open Europe's Mats Perrson, to tell us that the UK would face four options outside the EU, and "all four would be disadvantageous to the UK". Perrson then indulges in the classic "straw man" technique of presenting distorted views of each option, starting with the EFTA/EEA (Norwegian) option, which he classifies as "the worst of all worlds … it would literally be: not in the EU but run by it". Bluntly, this makes Perrson a liar – a thoroughly dishonest apparatchik, sucking up to his paymaster, Lord Leach, to spread disinformation in a manner that would have made Goebbels proud. We get nothing of the basics - just sheer propaganda which demonstrates that Open Europe has joined the dark side. Fortunately, though, Perrson's lies are in the Guardian, read mainly by those whose sympathies already rest with the EU, so the damage done is limited. However, one can expect to see more of Perrson as the campaign hots up. He will be much in demand as an aid to wrecking any "no" campaign. On the other hand, we seems to have recruited an unlikely ally in the form of Jacques Delors who acknowledges that Britain could leave the European Union and enter into a different sort of partnership with the EU. "If the British cannot support the trend towards more integration in Europe, we can nevertheless remain friends, but on a different basis", says Delors, actually suggesting " … a form such as a European economic area or a free trade agreement". Perrson notwithstanding, the EFTA/EEA option is very far from being in the EU, and as a halfway house towards a complete exit, it could be the ideal way to ease ourselves out of the EU with minimum disruption. Given that the Delors suggestion would require us to invoke Article 50, there is nothing to stop us seeking a time-limited membership of EFTA/EEA, with break options – say – at five year intervals. Furthermore, with the UK in EFTA, it would become a very different and much more powerful organisation, which could then seek to renegotiate the EEA agreement. One other issue that could also be explored is the possibility of other EU members joining us. With the UK out of the EU, we could even see Ireland, Denmark, Sweden (where hostility to the euro is at record levels), Finland and the Baltic states following in our wake. The point here is that the EU itself is set on altering its own geometry, creating its inner zone and an "outer circle". We have no need to accept this second class status, and can use Article 50 to define a relationship with the EU and, as Delors, indicates, remain friends. Here, there is one thing for certain. As long as we remain in the EU, we can never be at ease. To progress, we must leave. That is not only in our interest, but in that of all the other members. Continued membership, with or without the fabled "unicorn" option (renegotiation), is simply not real world politics.